I just has the greatest mind blowing experience at Kachina Lodge in Taos for the paranormal convention (2011 ASPE Paranormal Symposium). I participated in a ceremony outside after a lecture with an interpreter. If you're Anglo, we will be affected. (Hope my great uncle was right that I have some Cherokee in the family, at least my kids are mixed.) During the ceremony a helicopter flew over to check us out. Saw the men in black in a black car with dark tinted windows pass my room. Met the Reverend Bishop Joh Duffey that learned lessons during an exorcism. He was so kind and helpful. Nothing scary. Please go talk to him, I just love his wisdom. Virginia Lonesky. I had a workshop with her the next day and avoided her, went an hour late from her class and she ran out and told me when I calmed down to come back after I ate. I really enjoyed her company. For some reason, if felt like she was my teacher. She gave me a fantastic labyrinth we made outside to use portably with a cloth to learn how to meditate. 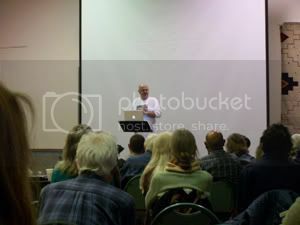 Attended a guy's free workshop, Steven Jones that had fantastic abductions for the last 30 years, Got healed by Michelle Many. Saw my friend Janet and she didn't know who I was at first and my husband seemed to absorb her MS and aches and pains. Many sold us some tapes to help us with healing and meditation. Bought cool t-shirts from ASPE booth. Free breakfast every morning. (And for $59 price for ASPE attendance with pool and hot tub, how can you get a better deal anywhere?) Wish I was invited to the first meet and greet but I was unable to attend the entire week so I didn't pay for the symposium with unlimited access. Spent as much on workshops though. But loved the workshops so it was worth it. Got some light anomalies, then the labyrinth ceremony took place in the dark on my birthday. Wish I could of stayed all week. Met a new and unique person around every corner. If you have the time, go for at least the last day Sunday. Honestly, if you believe in this, this is the place to meet the nicest like minded souls. I've got too big an Aura. Don't know how to change that. Probably drive everybody nuts. Loved it, someday I'll get to attend the enter experience. Love you all!!! Now I'm wolf sister according to one psychic. Can't wait till next year. 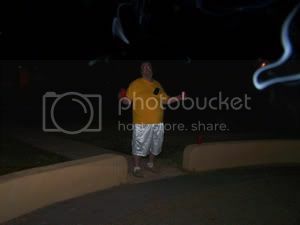 Wish I could of went to the UFO hunt. And got a map for the unchanged circle self guided haunted tour. Love to you all and open your mind. Good and unusual things to come. Just open your mind, wish for peace and next blog will talk to about some healing alien encounters for relatives in my family. Love your neighbor. Let's get this world healed the aliens have had enough of our destroying our environment. Labyrinth at Aspe on my birthday after ceremony in the dark. 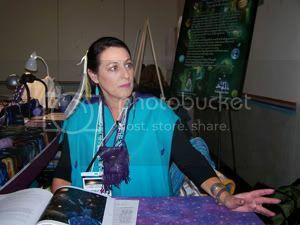 Michelle Many in free vendor area - hypnotherapy, healed us with tuning forks and meditations. 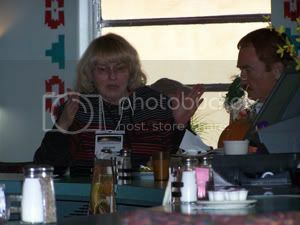 Owner of Aspefiles.org and personal great friend having breakfast with Travis Walton.